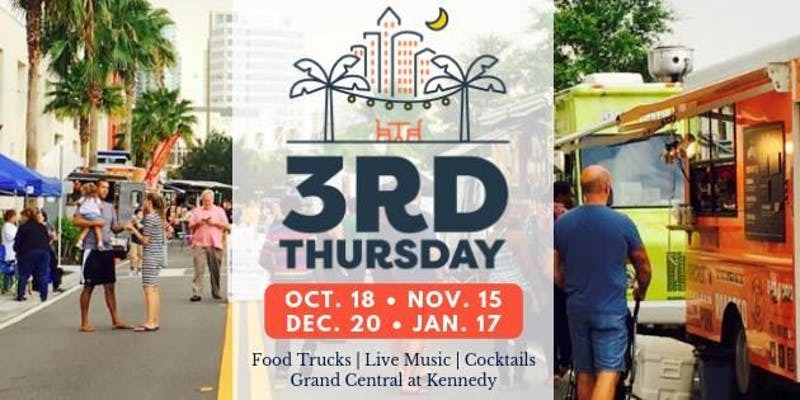 3rd Thursday Tampa is Downtown Tampa's Monthly Street Food Fest! 3rd Thursday Tampa is Downtown Tampa's Monthly Street Food Fest! Join us for some all out – outside food fun located at Grand Central at Kennedy 1208 E. Kennedy Blvd 33602. This event is a gourmet Food Truck event featuring Live Music and Cocktails provided by the Pour House Tampa. Located on Madison Street at Grand Central at Kennedy in the center of the Channel District of Downtown Tampa! This event is free to attend as the trucks and bars offer their products for sale. Free 2 hour parking is located on site and Dogs are welcome. The fun starts at 6pm sharp and ends at 10pm. For more info about this event please visit us at www.tampabaymarkets.com and click on 3rd Thursday. Interested in becoming a vendor? Visit http://tampabaymarkets.com/become-a-vendor.